I know it seems like I’ve come to Japan to eat, and while it may seem like eating is the main focus of my vacation, it’s not the true purpose of my visit. I’m fortunate to have an amazing Great Uncle, who in his latter years, has decided that it’s important for the family to get together every few years. Now when I say family, I’m not talking about visiting a couple of relatives here and there, but on my dad’s side, we’re talking about a BIG reunion of almost 100. It’s nice to have a reason to visit, because in the end, I not only get to see my dad’s side of the family but my mom’s as well. After 3+ days in Tokyo on my own, it was nice to take the train to Kyoto to meet up with my family to share a more intimate meal with my Uncle Arthur. 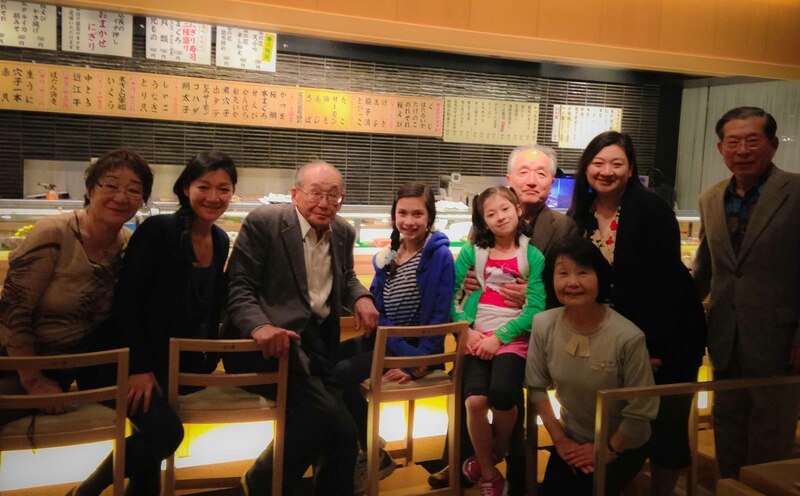 I had originally thought of spending more time in Tokyo, but after I heard that my Uncle had arranged a pre-pre reunion meal in Kyoto, I knew it was important to be there for it. There are a number of people in my life that I attribute my love for food to. Uncle Arthur’s on that list because he fostered my indulgence when it comes to ordering whatever you want, even if you know it’s going to be too much food. 2 of my food memories as a child are with Uncle Arthur. One was when I was very young and visiting him in San Diego. He took my family to a sushi restaurant and wanted us to try everything. I remember pointing and laughing at a photo of tamago (egg) sushi because of the thin stripe of nori on the gigantic egg. The thing with Uncle Arthur is that if you show interest in something, he wants you to experience it, which meant he ordered it for us. I don’t necessarily remember the egg, but I do remember him indulging us. An even more vivid memory was when I was 13 and visiting my Uncle Arthur in Kyoto. Again, we were having sushi, this time he asked us what we wanted. 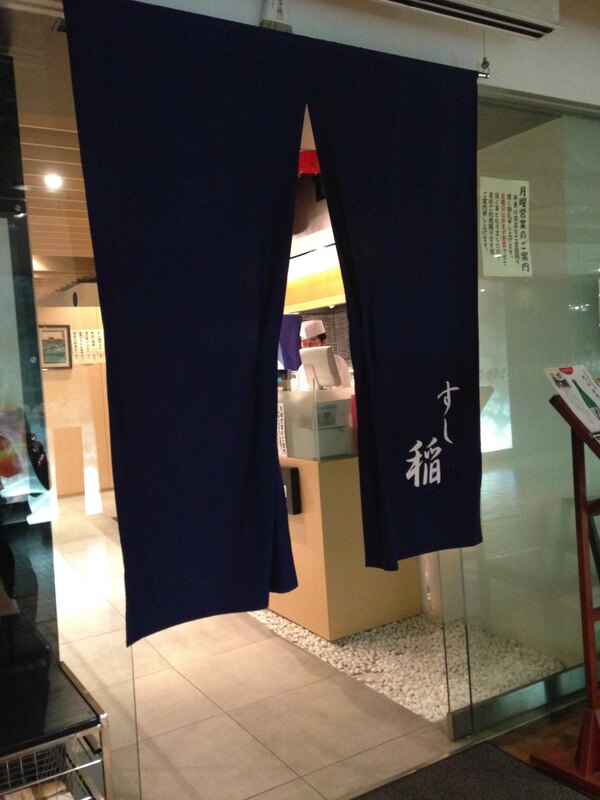 I remember that ama ebi (raw sweet shrimp) was my favourite at the time and he ordered odori ebi (dancing prawn). What I didn’t know was they were dancing because they were alive only moments before and although the prawns were de-headed and shelled, they still had a bit of “life” in them. The prawns were still twitching as they were served and the flesh slightly contracted when I bit into it. It was so fascinating and although I should have been appalled like my sister was, I loved it. I think it was then that my dad declared, “I eat everything”. It’s that statement that’s made me push the limits on my dining experiences. I had great internet instructions to get to the Sushi Ina in Kyoto and was glad my tsukemen breakfast was so fast it allowed me to catch an earlier train out of Tokyo. In my family, on time means arriving at least 10 minutes early. My only regret was that I was going from meal to meal on the Shinkansen, which meant no eki-ben lunch on the train. The sushi chef at Sushi Ana’s father once worked with my uncle Arthur, so I knew we’d be treated well. What I was lucky enough to remember was that Uncle Arthur orders a lot of food. Even though we’re told to order whatever we want, I was prepared for there to be a whole meal’s worth of extras that would be served alongside. After my big breakfast at Rokurinsha, I ordered something small because I knew more would follow. My uncle looked almost disappointed that I only ordered a small plate of sashimi, but my memory did serve me correctly as the other dishes started hitting the table. 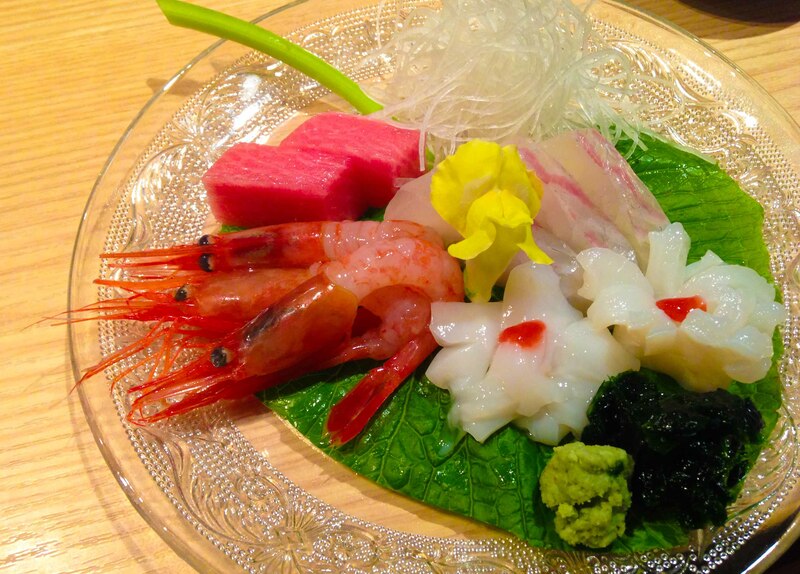 Sushiina Kaisen Salad – seafood salad with an onion soy dressing. 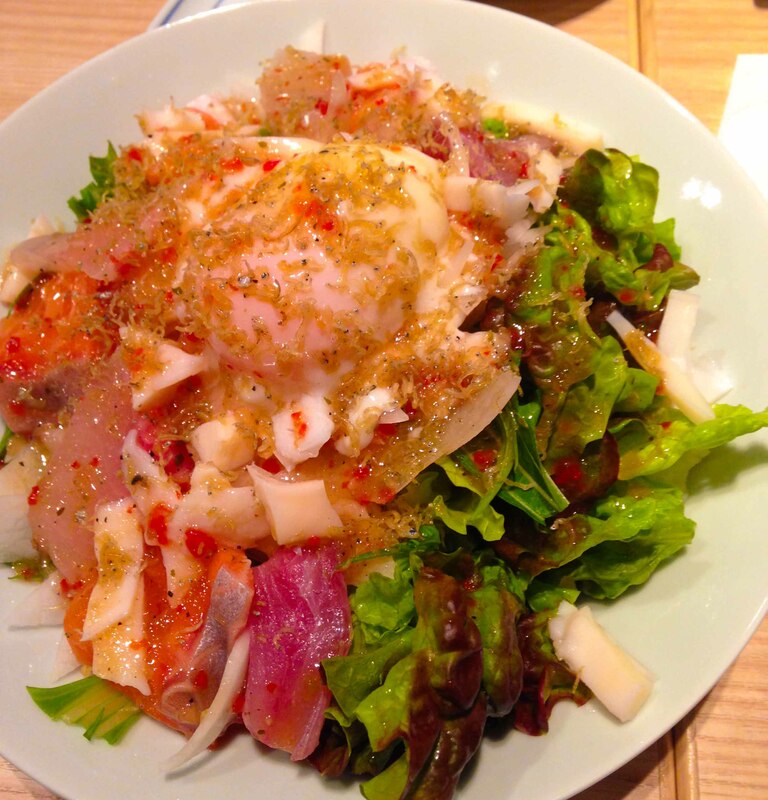 The soft onsen tamago is broken over-top and mixed into the salad to add a nice richness to the salad. We thought my nieces would like some shrimp tempura, of course 2 different kinds would hit the table. 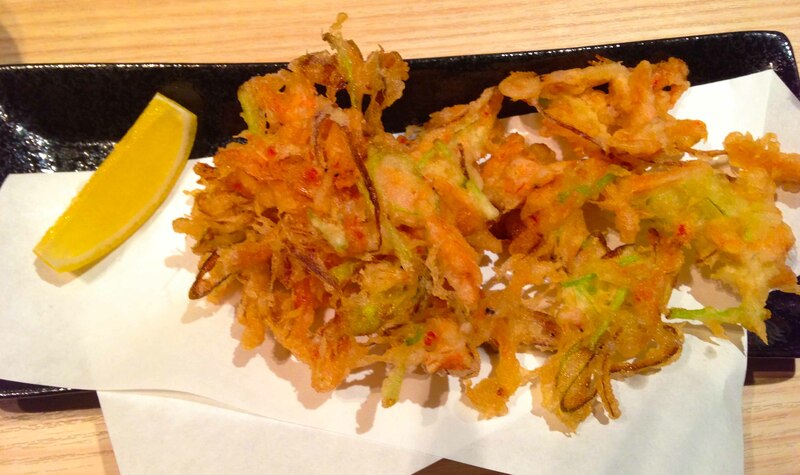 Shinsen yasai tempura – with matchstick veggies and little shrimp. 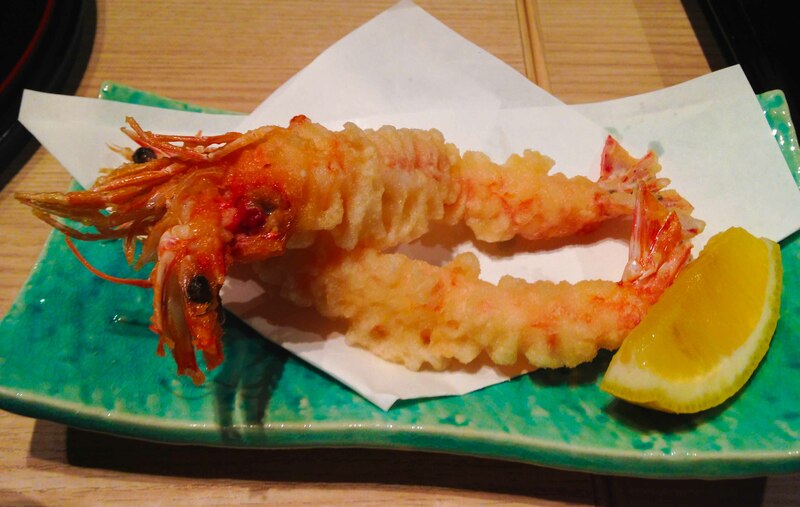 Kuruma ebi tempura – I gave my nieces the body while I crunched happily away on the head. I think they felt sorry for me, if only they knew, I got the best part! 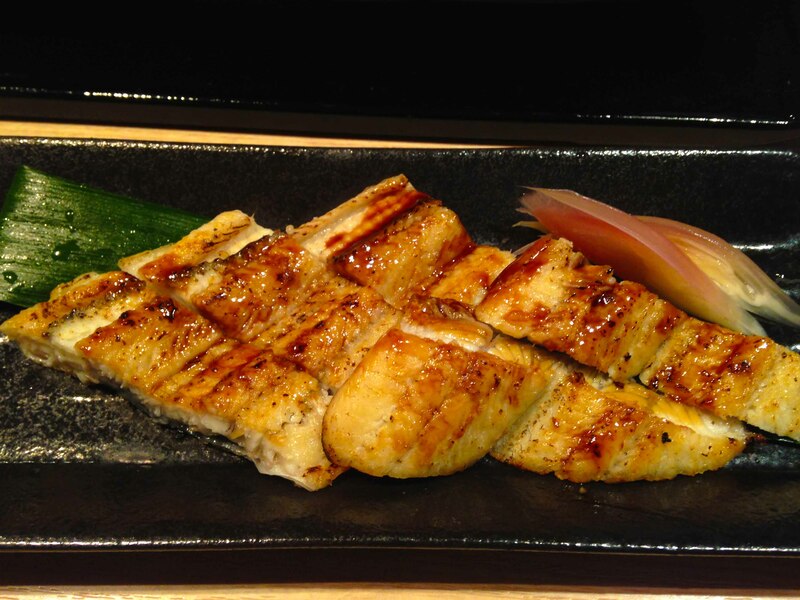 Unagi abrui – seared freshwater eel. 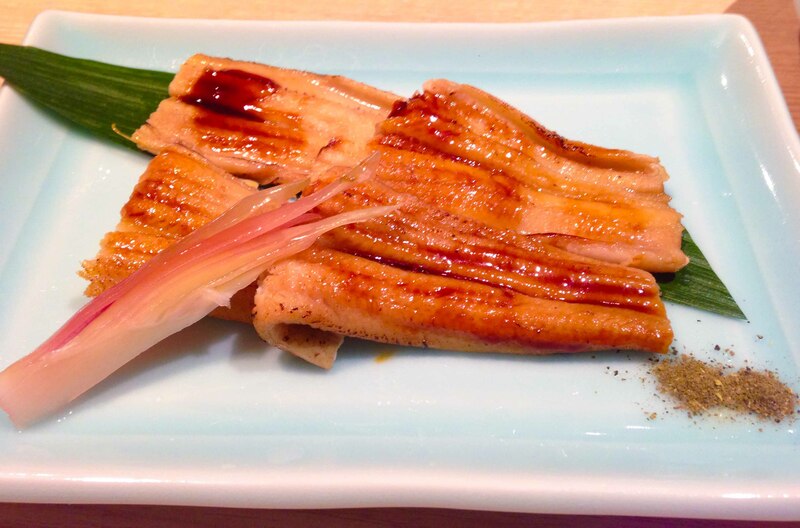 Anago aburi – sea eel. I enjoyed the side by side presentation of the eels prepared the same way. We get unagi at home, but anago isn’t as prevalent. Eaten this way, I was able to decide that I like anago more because it’s more delicate and less oily. That’s not to say I’d ever turn down an oily piece of unagi on rice. Lunch was done and I was happy I wasn’t overly stuffed compared to what my expectations were. I left happy that I was able to spend time with my Uncle Arthur and even happier that I’d see him a few more times on my trip. I was glad I made my way over from Tokyo to have this meal with him. Food is often the excuse to see family and it’s wonderful when both experiences make you happy. PS – Sushi Ina was a very nice place for lunch, conveniently located on the corner of Karusama & Shijo Streets in the heart of Kyoto. It’s very approachable and accessible to anyone and the prices for their delicious, high quality food seemed quite reasonable.